My husband and I are smitten with this little guy. He is the sweetest little man ever! 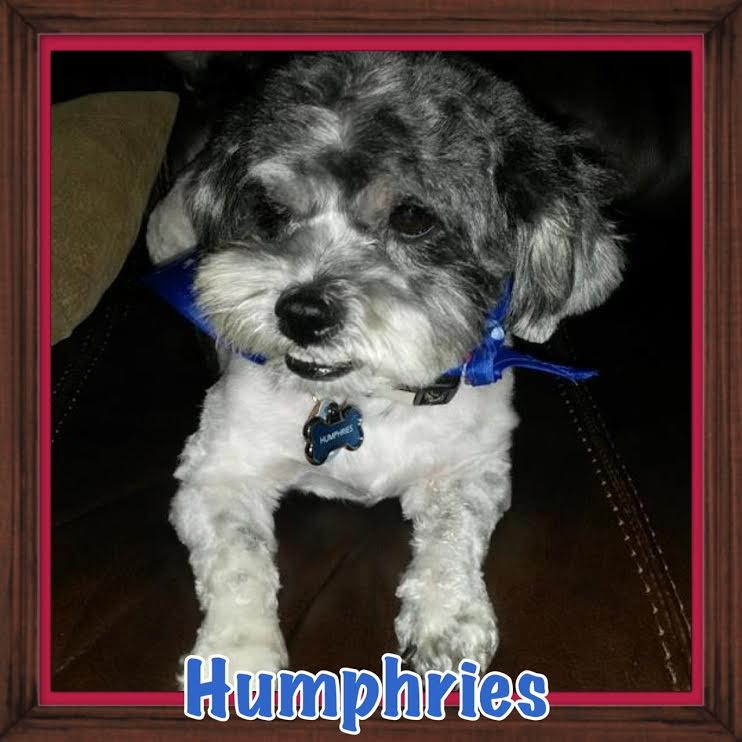 Humphries was lucky to have you and I’d like to think he is lucky to have us, too. He is definitely the king of our castle! I wanted to share this with you guys so you would know how AWESOME Gus is!! I saw him on Facebook (9/14/14) and fell in love. I went to see him at the shelter and brought him home a few days later, we had to wait for his hold to be up. 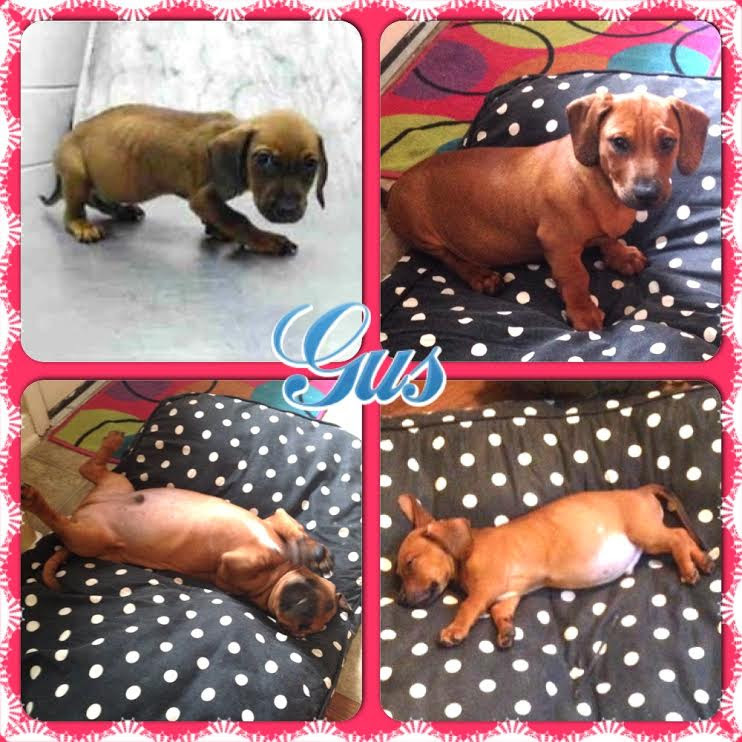 He made himself at home from the start =) We had 5 dogs, and Gus made 6!! He was the smallest at 4 lbs, but now is the second biggest – weighing in at 20ish pounds!! We thought he was all Doxie, but now I am not so sure. =) He has way to much “extra” skin, a huge head, and feet as big as my Lab. I think he is a Doxie on steroids =0!!! You can see from the pictures, he has grown! The poke-o-dot bed (as my 5 year old says) is his. He has slept on it from day one. If any of the other dogs are on it, he will bark until they move or I move them for him. If they join him after he is on the bed it’s ok, but not the other way around. He loves car rides, sleeping in the bed, and running through my flower beds. He might be chubby, but he can move!! He chases the other dogs and then will hide out in the flowers and attack them as they walk by. It is more like a hit and run, he knocks them over or rolls them around and then he is off to do it again. He goes to the beach a few times a week to see his “grandma” and his “cousins”. We are going to the store tonight to get him a new shirt, the one we have now looks like a tube top on him! He has only been with us 2 months, but I can tell he was meant for us. I am so thankful that I saw the picture that you posted and was able to get him. He did bring a nasty case of kennel cough home with him and shared it will all the dogs =) lol, but other than that he has been great! I hate to think what could have happened to him at the shelter, being so small… Oh well, now he is ours – spoiled, rotten, and a momma’s boy. He will cry when I walk away from him.Sorry if I rambled on, but I just love that little guy! I am not sure what kind of dog he is, but I would love to have 100 more just like him!! Enjoy the pictures – I will be sure to keep you guys updated on his progress. 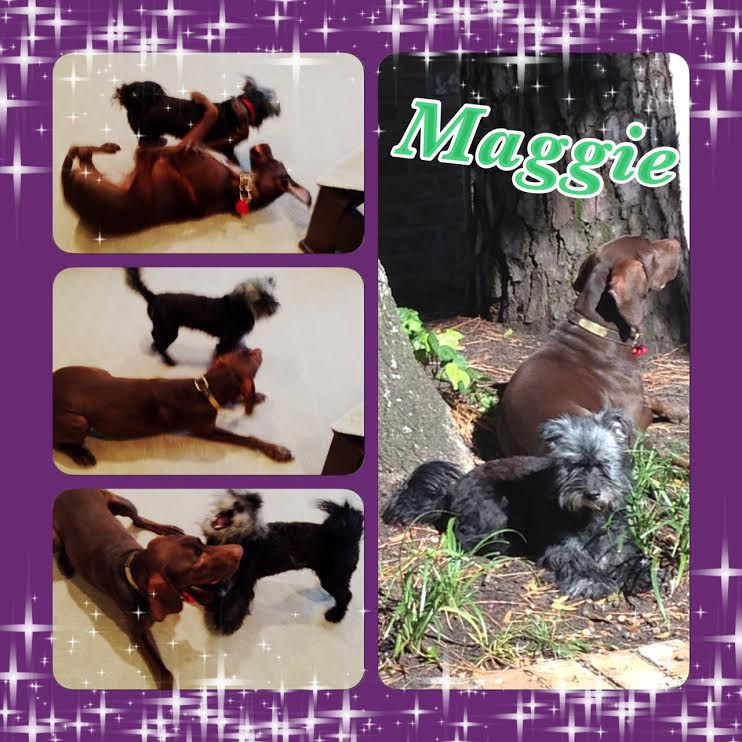 I wanted to let you know that Maggie has settled in beautifully and Charlie approves of having a friend! We are thrilled with the addition to our family and we thank you and the rest of the K-9 Angels Rescue team for the good work you do. 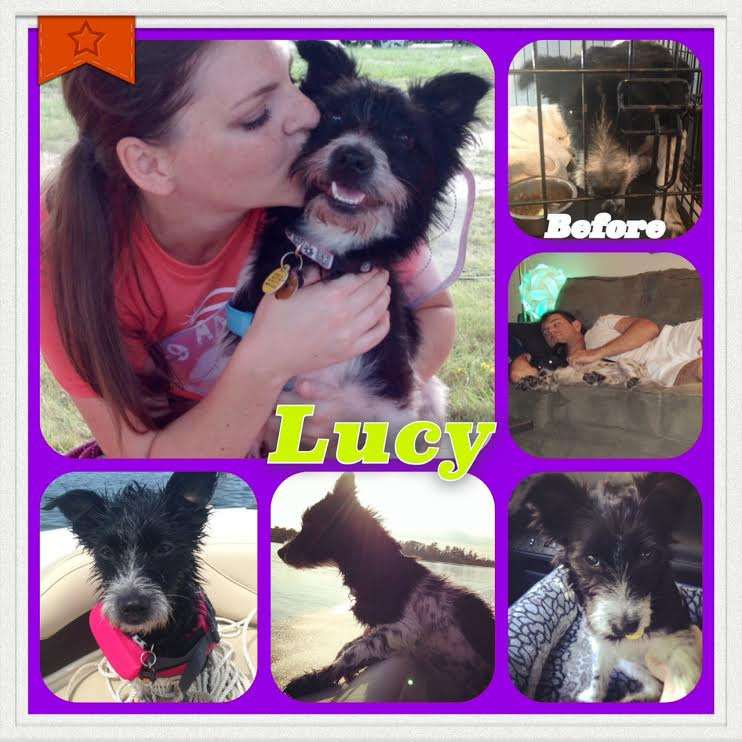 Just wanted to send a quick update on Lucy (pka Cindy). I included a picture of the day I adopted her so that everyone can see how far she has come! Lucy has certainly settled into her new life. We quickly found out that she absolutely LOVES the water, which can be both good (loving long days on the lake) and bad (finding every muddy puddle at the park.) She is adored by absolutely everyone that meets her and I get stopped all the time by people to tell me how beautiful a dog she is. We walked in the Strut Your Mutt walk in September to show support for rescue dogs, and especially K-9 Angels Rescue, since you guys brought us together. Thank you all so much for everything you do, and thank you for finding me my best friend. Lucy is my world. I’ve been meaning to email you guys to tell you how great Bella, formerly known as Belinda, is doing. When I adopted her around mid August she had kennel cough and hook worm. Then my vet noticed she was limping (it was so subtle at first I didn’t see it) and we discovered she needed surgery to correct her hip due to a malformation of the bone. She was limping and clearly in pain, so I went ahead and did the surgery as soon as possible. She has now kicked the kennel cough, hook worm, and just got her 9 weeks post surgery clearance to be able to attend the dog park, daycare or anything else she wants to do. She went to the dog park for the first time this past weekend and she did great. She is just cautious enough to be smart about it, but fearless enough to have fun. 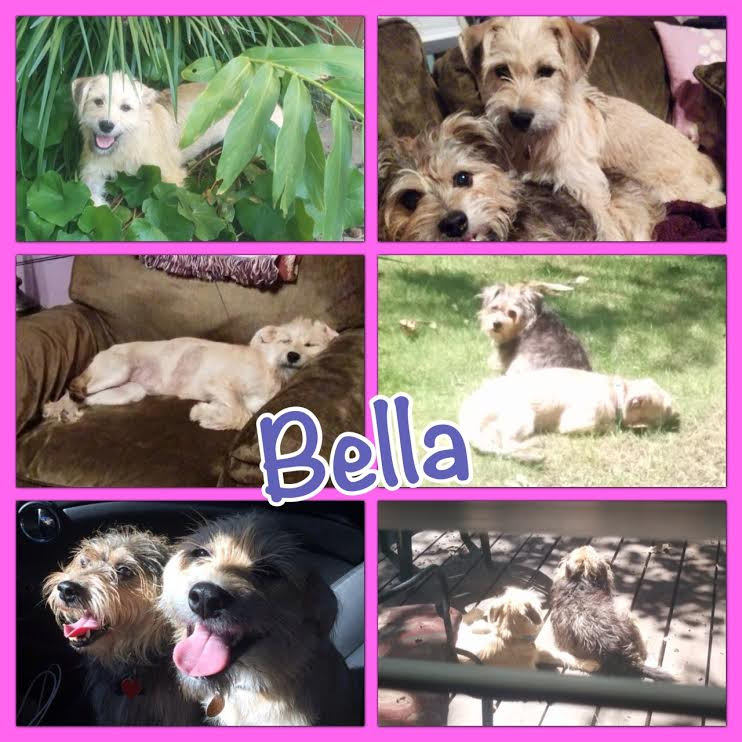 Bella has been doing great since I adopted her a couple months ago and has fit in well with my other dog and cat. The dogs play together and I catch them wrestling all the time. Since I work from home, she has been able to hang out with me during the day and quietly entertain herself. We go on walks throughout the day so she is happy. Her favorite past times are sitting on the couch with me, chewing on rawhides and going on walks. We tried the dog park last weekend, which went well and this week she might try a half day at daycare to see if she likes it. 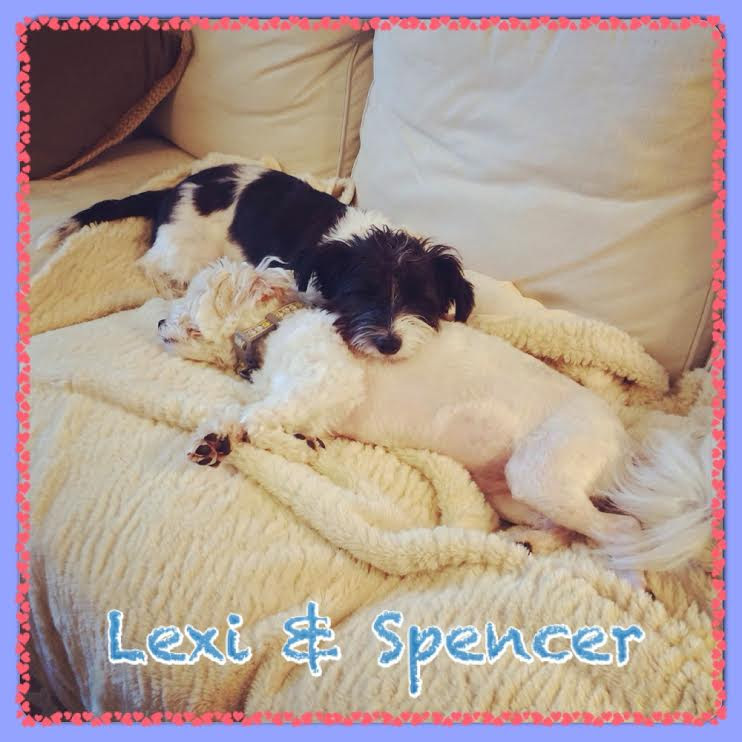 I just wanted to say thank you for helping us find these two fur babies. Becoming blind is one of the most common fears among adults. Losing eyesight as an adult would be a terrible loss. As humans, we rely on our sight to navigate through the world, appreciate our surroundings and much, much more. Being suddenly without sight would be terrible and a challenge for you and your loved ones. When inventor Silvie Bordeaux’s 13-year-old toy poodle went blind, she wasn’t willing to put her down, even though she walked into walls and fell down stairs. Instead, Bordeaux created a halo harness that warns dogs when they’re about to bump into an obstacle. Since it was perfected, it spread like wildfire to dogs of all ages and sizes. It even uses a pair of angel wings at the base to make these darling dogs that much cuter to everyone. …Although other designs are available. Today, Bordeaux hopes to see the device in dog shelters, where it will help blind dogs get adopted. What Silvie invented can potentially save thousands of lives in the coming years. Not too bad for a day’s work. If you want to purchase one of these for your dog, or perhaps donate one to a shelter near you, please visit her website. No dog needs to be put down for such an unacceptable reason anymore, especially with the introduction of this wonderful invention.